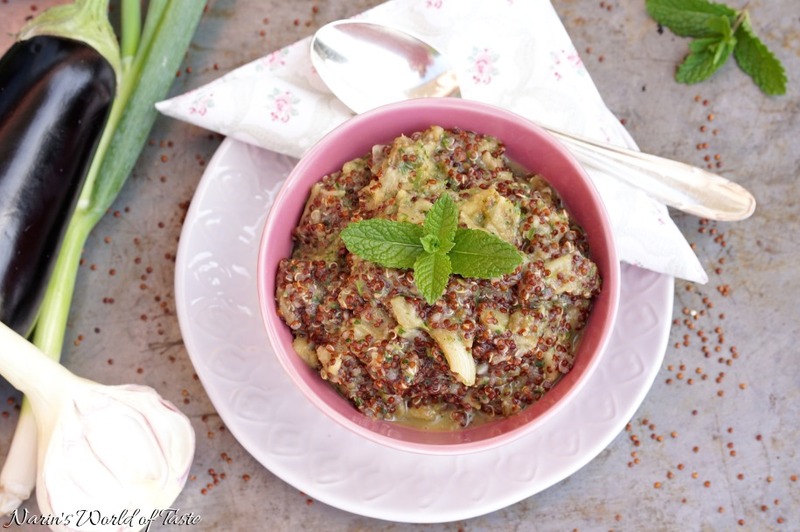 This vegan side dish is full of flavors and contains powerful ingredients such as red quinoa, herbs, and eggplant, which will help your body to stay healthy and energized. Eggplant, my husband’s favorite vegetable, belongs to the nightshade family like tomatoes and bell peppers and is well known for its unique taste and texture. Every time I prepare this dark purple vegetable, my husband will smell it right away and walk by with a huge smile. It not only brings happiness to people who love eggplant, it also contains health-improving components such as fiber, vitamins, and antioxidants. Start by preheating your oven to 200 °C / 390°F. Wash the eggplant, lemon, spring onion, and herbs. Peel the garlic. Pour the quinoa into a fine strainer and rinse throughly with cold water. 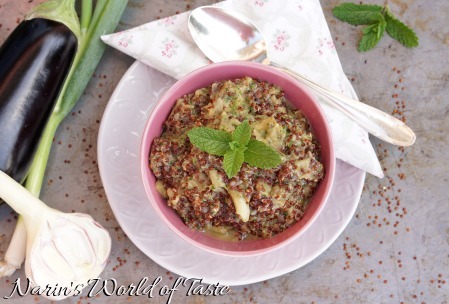 Add the quinoa into a medium-sized pot, add twice the amount of water (2 cups). Bring the quinoa to a boil and then reduce the heat to very low temperature. Cover the pot with a lid and let the quinoa simmer for about 15 minutes until all the water is gone and the quinoa popped – by this I mean the tiny spirals separating from the seeds. Meanwhile, once the oven is hot, place the whole eggplants in a casserole dish or on oven paper and bake them in the oven for about 40 – 45 minutes, turning them 2 – 3 times. Then let the quinoa and eggplant cool. Once the eggplant cooled down a little, remove the skin. Put one of the peeled eggplants into a food processor. Chop the other two eggplants roughly and put the pieces into a Tupperware or bowl. 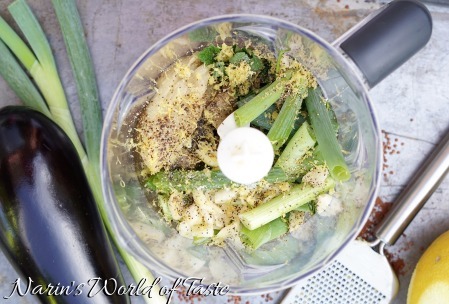 Chop the garlic, herbs, and spring onions roughly and zest the lemon with a zester. 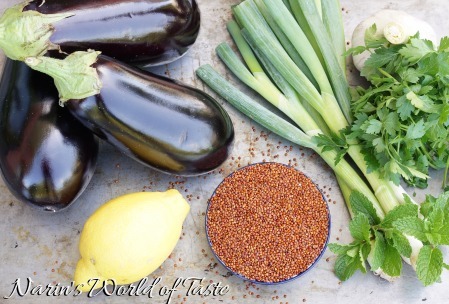 Add the garlic, herbs, spring onion, lemon zest, olive oil, salt & pepper to the eggplant in the food-processor. Puls the food processor until you end up with a creamy consistency. 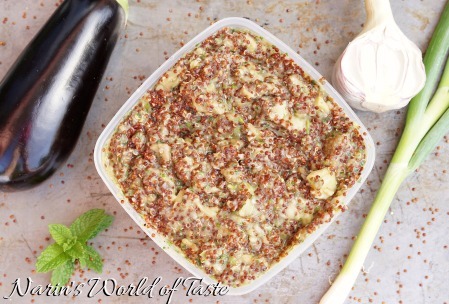 In a Tupperware or bowl combine the eggplant, quinoa, and mixture from the food-processor thoroughly. Store in a Tupperware in your fridge until serving. 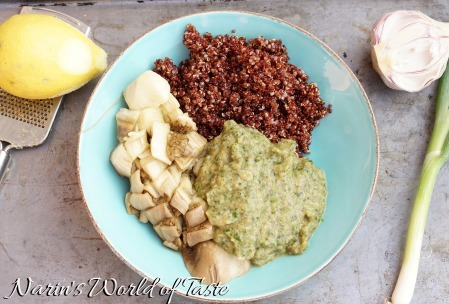 Pour the quinoa into a nice serving dish, you can serve it cold or heated, both ways are super delicious. Instead of a side dich, it can also be served as a delicious appetizer when welcoming guests.